The Eo Inn is a small boutique hotel located in downtown orlando on the old-world brick streets of a charming area called eola south. Situated on the northeast corner of lake eola park it is just a block away to the famous thornton park where many local shops and restaurants thrive. Most major downtown festivals and events takes place at lake eola park including a wonderful farmers market every sunday. Eo Inn has 20 smartly decorated rooms each with its own private bath. All rooms offer a queen size bed or a king size bed. Our newest room the double queen suite offers two queen size beds. The balcony rooms have a quaint covered patio perfect for relaxing outside. Views of downtown and lake eola park are available. Panera bread restaurant is located on the first floor and room service is available to all guests during front desk hours. A 24 hour innkeeper is available on site or just a phone call away. Other amenities include free wireless internet complimentary parking voice mail robes iron/ironing board hairdryers and cable with hbo. Eo inn has a jacuzzi on its second. 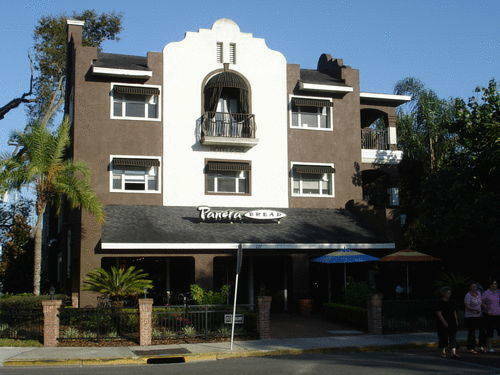 The Eo Inn is a small boutique hotel located downtown orlando on the old-world brick streets of a charming area called eola south. Situated on the northeast corner of lake eola park it is just a block away to the famous thornton park where many local shops and restaurants thrive. One night room and tax at time of booking.